Song, Hurn-joo: He was entrusted with a colossal mission for all important Korean independence movement for over 40 years. Song, Hurn-joo’s unwavering endeavors for the Korean independence movement are genuinely historical proportions by any standard. From 1905 and for the next 40 years until the day of Korean liberation and whenever there is a call to carry out an epochal event, Song willingly accepted whatever was thrust upon him and he astutely and superbly performed his job. However, despite the fact that he had performed his job in the Korean independence movement with a distinguished manner, historical evaluation for Song’s remarkable fulfillment is said to be inadequate at best. Song arrived in America in 1904 and next year, he assumed the post of Korean Cooperative Association to imbue the Koreans patriotism and the restoration of Korean sovereignty. While he was attending at Roanoke College in VA in 1907, he was called by the Korean King to act as a Korean language translator for three secret emissaries Lee Joon, Lee, Sang-sul and Lee, Wi-jong to Hague, the Netherlands. 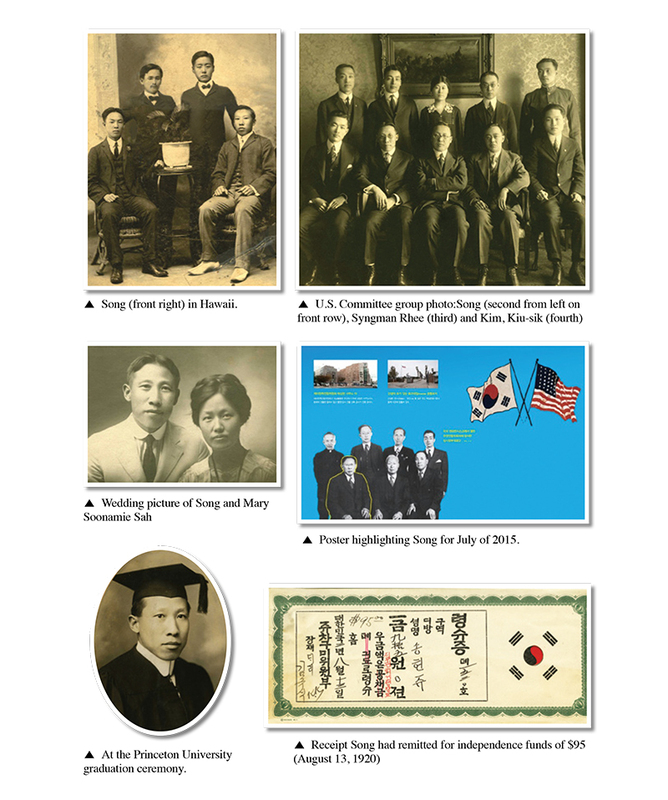 The Korean Empire issued a special governmental passport for this covert mission in March, 1906. He previously studied English at the Royal English Academy in Korea prior to his departing for America. He was fluent in English and he worked at the Immigration Office in Hawaii. Since he was an ordained deacon at the American Methodist Church, he was invited to assume a clergy post for the Korean Methodist Church there. It is clear that he was valued with his conviction of faith and leadership in the American church organization. Song returned to Roanoke and re-enrolled in 1910 and graduated in 1914. He obtained his master’s degree in history and political science from Princeton University in June, 1916. 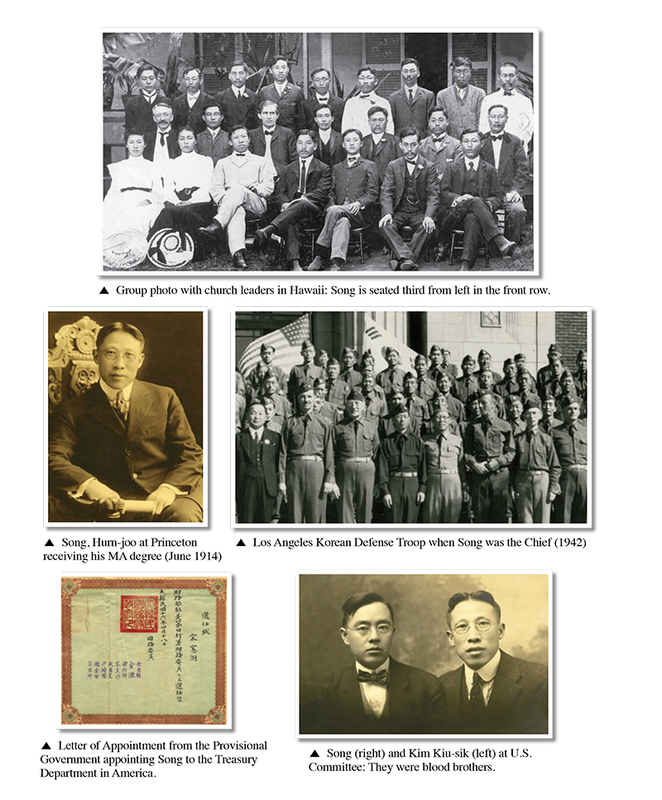 During his participation in the Korean in- dependence movement in America, Song had three special historical encounters with Syngman Rhee: First, Song and Rhee had worked together at a Korean Christian School in Hawaii and it was when Rhee solicited Song’s participation in the U.S. Committee for one year subsequent to the March First Korean Independence Movement in 1919. Second, on November 21, 1944 the Korean Provisional Government in Chongqing established the U.S. Committee at Washington, D.C. with Syngman Rhee, chairman and Song, Hurn-joo for diplomacy. Third, on April 25, 1945 during a UN Conference in San Francisco as representatives of the Provisional Government with Syngman Rhee as chairman and Song, Hurn-joo was one of five committee members for diplomacy arguing for Korean independence. It was a unique situation where Song had been working for Korean independence over a long period of time through the Korean National Association, yet he never participated in Rhee’s Dong Ji-Hoe. Kim, Kiu-sik and Song, Hurn-joo were in their cherished friendship like blood brothers as they studied together at Roanoke. Although, at U.S. Committee, Kim, Kiu-sik was a chairman while Song, Hurn-joo a committee member, when Syngman Rhee dismissed Song, Kim, Kiu-sik also tendered his resignation. Song accepted the chairman of construction and successfully finished his job of the building for the Korean National Association in North America on Jefferson Blvd in Los Angeles in 1938. He was hugely active in establishing the Korean Tiger Units with an approval from the U.S. Dept. of Army receiving military training as well in 1942, and in the same year, Song authored and published a Memorandum “Korea and the Pacific War.” Elected as a president of the Central Executive Committee both in 1939 and 1943, he discharged his mission in support of American participation in the war and the recognition of the Provisional Government while he efficiently carried out his national defense title as a representative of the Korean National Association in an All-Korean National Congress. He was re-elected as the president of the Korean National Association in North America and he worked as diligently for Korean independence. The single most important role he diligently performed was his collection of Korean independence funds and sent them to the Korean Provisional Government in China. Song attempted to return to Korea, yet when he heard Kim Goo was assassinated there, the despondent Song had ceased all activities in America. He passed away on July 31, 1965 at the age of 85. He was buried at the Rosedale Cemetery. He left an adoptive son Young Song, a grandson Kim, Dong-gook and his great- grandson Mark Kim, a Long Beach Superior Court Judge. On July 2015, the Ministry of Patriots and Veterans Affairs of Korea designated “July” as the month of patriot Song, Hurn-joo and sponsored an educational independence seminar. Song, Hurn-joo had left an indelible word for the Korean independence: “One cannot achieve national independence without the help of outside in the absence of one’s hard work.” In 1995, the South Korean government posthumously recognized him with the Order of Merit of National Foundation / Independence Award for his unwavering dedication and whole-heart- ed commitment to the Korean independence movement. 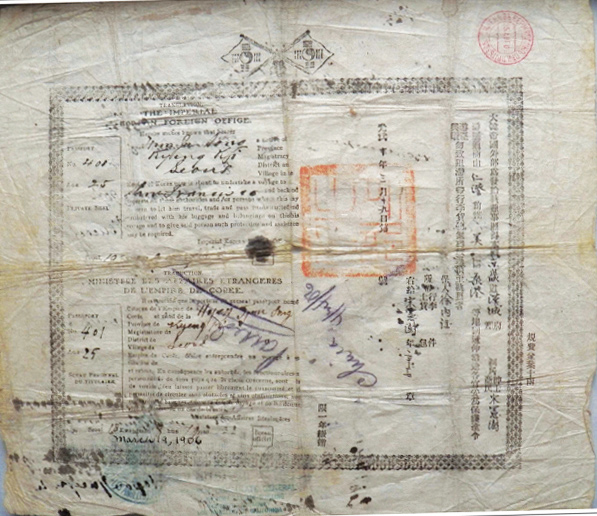 ▲ Korean passport issued on March 19, 1906 showing the countries including Russia. Song travelled through to act as an official interpreter for Korean emissaries at the Hague Conference.